The theory of plate tectonics was put forward in the 1960’s. It coincided with a time when a large amount of research was being conducted about the ocean floors. Since then better understanding and technology have refined the theory to explain how the Earth has been shaped. 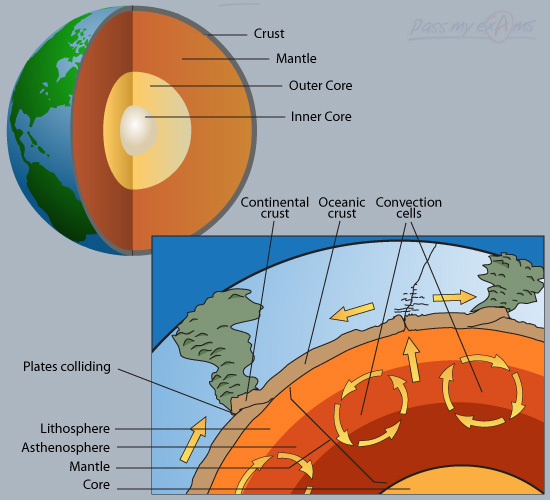 The theory states that the Earth’s crust is broken into large and smaller pieces called plates. These massive slabs of solid rock are made up of both continental and oceanic lithosphere (the crust and uppermost mantle). The sizes of these plates vary greatly from a few hundred to thousands of kilometres across. All the plates are constantly moving in different directions at different speeds (from 2cm to 10cm a year). The force that drives the tectonic plates to move is the convective flow or convective cell of the hot magma upon which the tectonic plates lie. Magma deep in the Earth’s core is superheated by the heat released from the nuclear reactions taking place in the core along with the residual heat left over from the formation of the Earth. This superheated magma rises to the lithosphere where it spreads out, cools and sinks back down. Where it is reheated and rises again. This cycle is repeated over and over again to form a convective cell.